To overcome something, you have to understand what a perfect engine it is. That’s how you fight disease. Rules. 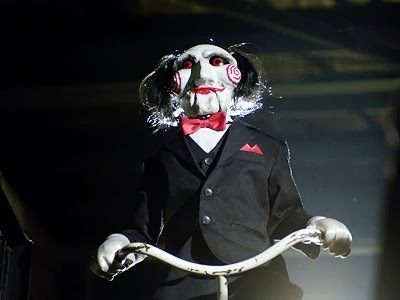 Jigsaw's motive originated from the moment where he painfully survived his attempted car crash suicide. Jigsaw’s hopelessly negative outlook was rooted in his experience of dealing with a bureaucratic health care system that blocks his attempts at pursuing adequate health care. Inspired, by his own struggle Jigsaw (like a proper social worker) launched a cruisade to help one person at at time out their personal drudgery. By creating games to materialize the internal struggle, or lack there of, Jigsaw forced his victims to confront their sins. In the first round picked a drug addict, an overweight suicidal man and a pyromaniac. How do the lives of these individuals measure up against Jigsaws experience? They don’t. The cast of victim’s “sins” fall into two categories; mental disorder and addiction. What is Jigsaw’s sin? Self loathing and hopelessness. Unable to acquire treatment for his cancer and he fell into a downward spiral resulting in a death wish. Devaluing life is was Jigsaws sin. A sin so great he generalized this as the first cause of all manipulative behavior in the world. The junkie, the pyro and the obese are unified by dishonoring the value of of their lives. But did Jigsaw accurately assess his victims? Adam, for example, doesn't get the same justification as to why he is in the game. The games, especially in the last half of the series, include this collateral damage as part of the system much like Jigsaw was collateral damage in regaurds to the health care system. Bootstraps. Is Jigsaw a republican? I think this question can be answered by another question. What is the real problem here? Jigsaw’s wanted to live and the health care system denied treatment. Rather then focus on the bureaucratic apparatus (the clear enemy) he blames Dr. Gordon for failing to respect his life. Isn’t the obvious choice not to blame the individual who is acting out their functionality, but the network of legal, economic and political relationships that create the situations limiting access to care? Instead Jigsaw blames himself and Dr. Gordon, individualizing the causality rather then systematizing it. Is this not bootstrap ethics par excellence; the insidious conservative victim-blaming ideology which argues no matter what your problem is that it is individual choice that identifies blame. Of course, the problem is that not everyone’s bootstraps are made of the same material. Not everyone is born wearing gold encrusted shoes. Being born into a world with out shoes or with shoes creates two very different pools of choices that a system allocates to an individual. Prison or college? Masks. Saw is as much a slasher as Friday the 13th. Mechanically, Saw fits the formula. A set of sinned individuals are hunted and killed. The bad guy offs a cast of characters one by one and the credits role. Where there is difference is in the displacing of body of the slasher. Instead of a chase through the woods by a man (or mother) with a mask and knife, jigsaw hides behind the camera, a voice distorter and makeup (at least in the first film). What saw brings to the table is a focus on the time between the hunting and killing. Jigsaw’s is still a masked slasher, but he uses cameras and distraction to hid himself in an attempt to force his victims to identify with their guilt. Even the concept of the Final Girl is not totally discarded as the second film, and ultimately the final film shows. Rather then emancipation The Final Victim takes on the republican ideology and becomes a non-traditional social worker. Robbing the disenfranchised of their voice and forcing them to confront their own disempowerment.